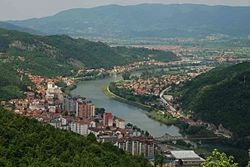 Zvornik (Cyrillic: Зворник, pronounced [zʋɔ̌rniːk]) is a city in Bosnia and Herzegovina. It is located in entity of Republika Srpska, on the left bank of the Drina river. As of 2013, it has a population of 58,856 inhabitants. The town of Mali Zvornik ("little Zvornik") lies directly across the river in Serbia. Kula Grad, a village that is part of Zvornik municipality, is home to a Middle Age fort, Zvornik fortress, built in the 12th century. Zvornik is first mentioned in 1410, although it was known as Zvonik ("bell tower") at that time. The town's geographic location has made it an important trade link between Bosnia and the east. For instance, the main road connecting Sarajevo and Belgrade runs through the city. The medieval fort known as Kula grad was built in the early 7th century and still stands on the Mlađevac mountainous range overlooking the Drina Valley. During the Ottoman period, Zvornik was the capital of the Sanjak of Zvornik (an administrative region) within the Eyalet of Bosnia. This was primarily the case because of the city's crucial role in the economy and the strategic importance of the city's location. The Sanjak of Zvornik was one of six Ottoman sanjaks with most developed shipbuilding (besides the sanjaks of Vidin, Nicopolis, Požega, Smederevo and Mohač). In 1806, Zvornik was home to Mehmed-beg Kulenović. Ustasha troops of the fascist Independent State of Croatia occupied Zvornik, along with most of Bosnia, in April 1941. The town was liberated in July 1943 by the 1st Proletarian Brigade during the Battle of Zvornik. During the Bosnian War (1992-1995) Zvornik's Bosniak population was expelled. The military attack of paramilitary groups that came from Serbia on Zvornik Bosniaks commenced on 8 April 1992. During April 1992, many European news stations daily reported Serb armed attacks and mass killings of the Bosniak population of Zvornik and the surrounding villages. On 19 May 1992, combined JNA, Serb paramilitary and Arkan's Tigers occupied Zvornik and Mali Zvornik. The suburbs of Karakaj and Čelopek were places of prisons where hundreds of local Bosniaks were killed. The remaining Bosniaks and non-Serbs were relegated to concentration camps and detention facilities throughout the area. During the war Serb forces destroyed mosques in and around the city. According to the 2013 census results, the city of Zvornik has 58,856 inhabitants. The Cultural Summer of Zvornik (Zvorničko kulturno ljeto) is an annual event held in the first week of August and usually lasts for six days. Its main objective is to become a traditional cultural event which will open the doors of Zvornik for recognized cultural values. The festival was first held in August 2001 as a local event and until now (2015) it grew up to one of to biggest festivals on the Balkans. In 2007, famous singers such as Neda Ukraden and Sandi Cenov participated, but in 2008 this festival managed to feature some of the most notable stars from former Yugoslavia, like Željko Joksimović, Hari Mata Hari, Van Gogh, Marinko Rokvić and others. Music is not the only thing that this fest offers, there is also a regatta on the river Drina, a fun marathon and many cultural events and competitions during day and night. The local football clubs, FK Drina Zvornik and ŽFK Drina Zvornik, play in the First League of the Republika Srpska. Members of the First league of Republika Srpska also are volleyball and handball clubs Zvornik. ^ Godis̆njak grada Beograda. Beogradske novine. 1979. p. 35. Retrieved 7 September 2013. Ипак градња бродова се посебно везивала за шест санџака: никопољски, видински, смедеревски, зворнички, пожешки и мохачки. ^ ""One of the biggest" mass graves found in Bosnia". BBC News. 8 October 1998. Retrieved 11 September 2016. ^ a b "Popis 2013 u BiH – Zvornik". statistika.ba (in Bosnian). Retrieved 29 December 2018. ^ "Zvornik's summer – Turistička organizacija grada Zvornik". zvornikturizam.org. Turistička organizacija grada Zvornika. Retrieved 19 January 2018. Wikimedia Commons has media related to Zvornik. This page was last edited on 7 April 2019, at 11:42 (UTC).